Lalu Yadav was also hoping for an acquittal after Dr Jagannath Mishra. It was only when Lalu's lawyer told them about the conviction, that they got it. Lalu and his son were stunned. "Look, they set doctor saheb (as Dr Mishra is called) free and punished me. It is strange," a shocked Lalu Yadav said, his last words before he was formally taken into custody. RANCHI: It had been a long night. 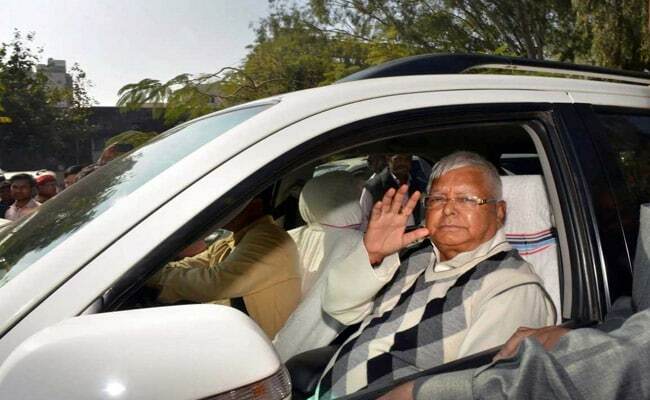 The last, may be in a few weeks or months, that Lalu Yadav was going to spend with family and friends. And before he stood before the judge to decide his case the next morning, he wanted to spend it with them. In the room at the railways guest house in Jharkhand capital Ranchi, and later, around a bonfire. So when CBI Judge Shivpal Singh deferred the verdict in the fodder scam case on Saturday to later in the afternoon, the Rashtriya Janata Dal chief headed straight back to the guest house to wait his turn. Soon enough, news came the Enforcement Directorate filing charges against his eldest daughter Misa Bharti, also a Rajya Sabha member and her husband. It was something Lalu Yadav had anticipated, sooner than later. He made a few calls to check up on his daughter and the case. There was nothing more he could do. A conviction in the fodder scam case staring him in the face, Lalu Yadav decided to make the most of his time. He decided to take a power nap. Back at a court around 3.30 pm, two former chief ministers of Bihar, Lalu Yadav and Dr Jagannath Mishra, waited their turn. The court first ruled on the fate of a senior Jharkhand police officer PS Natrajan sacked for allegedly sexually exploiting a tribal girl. He was acquitted. The 22 accused including the two former chief ministers were next. After a roll call - each accused standing in the witness box had to raise their hand when their name was called by the court - the judge called out six of them including Dr Jagannath Mishra and asked them to leave the box. They had been acquitted. Dr Mishra too had been prepared for it. He had been convicted by the court in another fodder scam case back in 2013 and like Lalu Yadav, was out of bail. "Why should I leave?" he asked feebly, worried that his worst fears had come true. This reporter had to repeat the verdict thrice before he actually came to terms with his acquittal. First, a faint smile and then, he rushed out of the court in jubilation. That acquittal appeared to brighten Lalu Yadav and son Tejashwi's face too. They expected a similar verdict. And just when they expected the judge to pronounce a similar verdict for them too, came the bombshell. They probably missed it. Because it was only when Lalu Yadav's lawyer told them about the conviction, that they got it. Lalu and his son were stunned. "Look, they set doctor saheb (as Dr Mishra is called) free and punished me. It is strange," a shocked Lalu Yadav said, his last words before he was formally taken into custody. Outside Dr Mishra faced the cameras. "Finally, I have been acquitted in this fodder scam case... Truth always wins in the end". Lalu Yadav's party leaders suggested this had something to do with Lalu Yadav's caste. "One gets bail, the other jail. This is a game," former union minister Raghuvansh Prasad said.